IMI has long been a strong donor to charitable causes, especially local organizations in the communities where they have operations. With over 100 locations in five states, they had a desire to consolidate their giving behind a larger, broad-based cause. The first thing we did was to help the client come up with a direction. Since so much of their giving had been to children’s advocacy groups, especially in the area of education, that was chosen as the focus of corporate charitable giving. Next, we came up with a slogan that stated IMI’s firm belief in education and tied it nicely with the company’s prime source of income: concrete. "Concrete is a solid foundation for life” became the catch phrase that defined their emphasis in charitable giving. We modified the logo to reflect this educational directional focus. In the next phase of our planning, we looked for an organization that could provide an educational opportunity for as many students as possible. 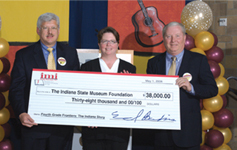 IMI already had a relationship with the Indiana State Museum. On two occasions, the IMI aggregates division had found fossils in their quarries and had invited the State Museum’s paleontologists to excavate and catalog the finds. Many of these fossils are on display in the museum. We approached the museum and the Indiana Department of Education on behalf of IMI and began a discussion of programming that would impact a large number of Indiana school children. This grew to become the Fourth Grade Frontiers program. In Indiana public schools, fourth grade is the year when students are taught Indiana history. This fit nicely with the museum’s galleries. At any point in the school year, a teacher could bring the students into the museum and find a time period about which they were currently teaching. Fourth Grade Frontiers did several things to help students and teachers. First, all students attending with their classes received admission for $1. Teachers and chaperons were admitted free of charge. Each student was given a passport. This guided them through the museum galleries and asked them to find a specific piece in each, much like a scavenger hunt. When they did, they received a stamp on a page of the passport. Each teacher also received a set of 10 posters that had photos of the artifacts and displays found in the museum. 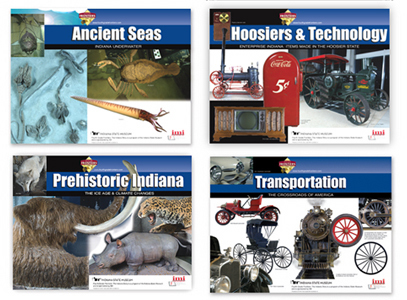 These posters walked through 10 different time periods in Indiana’s history. This helped to reiterate the museum experience back in the classroom. To market this program, we scheduled a public announcement at the museum. A check was given to the museum’s foundation. We followed up with a press release. The next phase of marketing came in a direct mail piece to fourth grade teachers throughout the state. This was sent at three strategic times during the school year. The program proved to be a success. The museum counted 27,000 Fourth Grade Frontier visitors during the three year program. The key alliance between business and museum was a testament to some strategic planning on the front end that paid dividends on the back end.